Explain the Primary Root Growth? Primary Growth in Roots : Roots grow down and through the soil by adding new cells at the tip of the root (called the root tip). There is a group of cells called the apical meristem at the tip that actively divide by mitotic division to produce new cells to the inside of the root that will ultimately become the procambium, the ground meristem, and the protoderm. 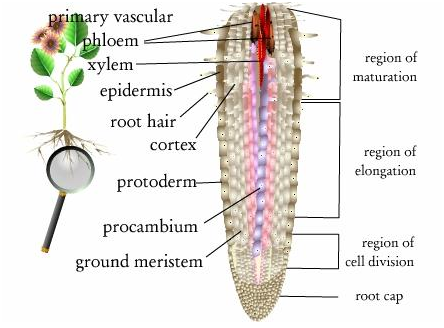 The apical meristem also cuts off cells to the outside of the root, which form a protective root cap. The root cap forms a protective barrier to shield the delicate meristematic tissue from the abrasive soil, sand and rocks through which the root must grow. The root cap even produces a polysaccharide jelly to lubricate the root as it glides through the soil. There are 3 separate tissue regions that make up the root tip: the cells that undergo cell division, or the apical meristem tissues, are called the region of cell division; the area above the dividing cells in which the newly formed cells elongate, is referred to as the region of elongation; and the zone above that is called the region of maturation, where the cells develop ("differentiate") and become fully mature and functional. The middle of the region of cell division is actually composed of cells that divide at a slower rate, and are therefore referred to as the "quiescent center." Cells that are produced in a direction towards the tip or front of the root form the root cap. As you might expect, the outer cells of the root cap get worn away and therefore require continual replacement by the apical meristem.